Owing to our sound experience, we have been successful in catering to the requirements of our esteemed clients by offering quality Winding Rewinding Machine For Batch Printing. 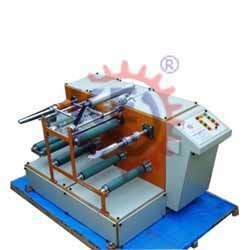 The offered rewinding machines are extensively used for rectifying defective printed & laminated reels. Moreover, customers can avail these machines from us in varied specifications and grades as per their requirements. We offer these rewinding machines to the clients at industry leading prices. Any make inkjet printer / thermal printer can be supplied along with our winderrewinder machine like markem-imaje, domino, videojet, alphajet, control print, jet inks, linx,etc.